Home » News Items » Green Screen Australia! The Australian travel board wanted to add a bit of fun to their promotion in Southampton, and by hiring the Super Photo Booth form us they did just that. Our photo booth had green screen enabled to give the customers a choice between having their pictures taken in western Australia or having them taken in the gold coast. They simply sat in the photo booth, and using the touch screen they selected the back ground they wanted, then the photo booth took 4 pictures and instantly printed. We also allowed people to email their prints to themselves from the photo booth along with a promotional message from the travel board, and we provided them with all the email address the booth captured. 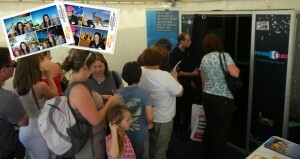 The photo booth hire proved a massive success bringing hundreds of people over to the stand and delivering perfect Australian background print after print!